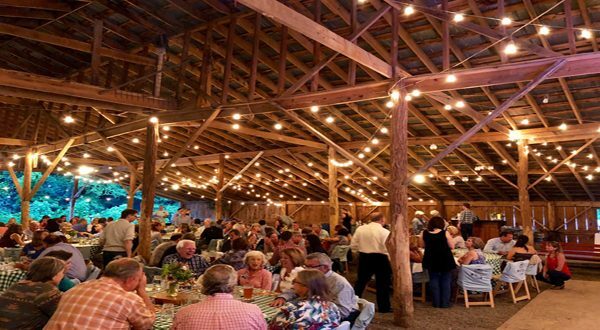 Representative John Ager (NC-115) and his wife Annie, owners of Hickory Nut Gap Farm, called the square dance with live music provided by both NewTown and the Bonafide Band during the evening. GSMNP Superintendent Cassius Cash, Representative Chuck McGrady (NC-117) and former Congressman and Friends of the Smokies board director Heath Shuler also attended the event. The Smokies Stomp Barn Party is held in Fairview, NC at Hickory Nut Gap Farm and is presented by Wandering Rose Travels and Webb Investment Services with support from Blue Ghost Brewing, Merrill Lynch, Beverly-Hanks, Biltmore Wines, Blue Ridge Printing, Wilcox Travel & Tours, Insurance Service of Asheville, Navitat Canopy Adventures, Roberts & Stevens Attorneys at Law, White Labs, Wildland Trekking, Dan & Deener Matthews, Chase & Clary Pickering, Rob & Meridith Powell, and Jim & Jan Hart.